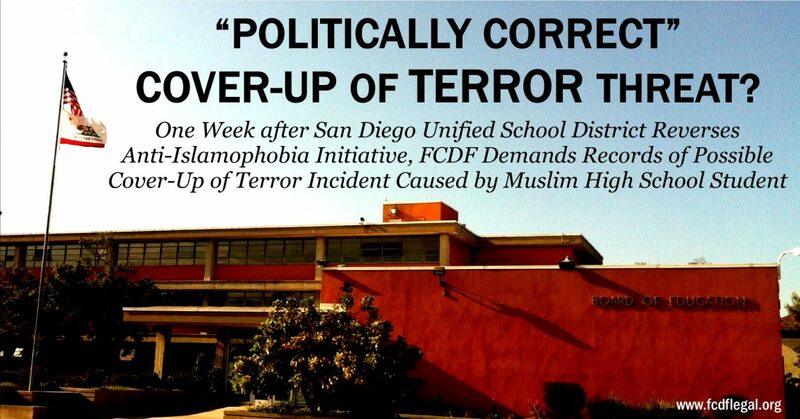 As part of its efforts to resolve its “Anti-Islamophobia” lawsuit against the San Diego Unified School District (SDUSD) outside of court, the Freedom of Conscience Defense Fund (FCDF) has demanded expedited processing of its California Public Records Act (CPRA) requests regarding SDUSD’s relationship with the Council on American-Islamic Relations (CAIR) as well as a reported cover-up of a terror incident in early May committed by a Muslim high school student. On May 5, 2017, FCDF submitted a detailed CPRA request asking for any and all records pertaining to SDUSD’s collaboration with CAIR to implement an “Anti-Islamophobia” initiative that would provide special benefits to Muslim students and revise school curricula to make it more “inclusive” to Muslim students and portray Islamic history more favorably. Nearly, three months later, the school district has not produced a single record. The request for expedited processing comes a week after SDUSD’s Board of Education overturned the “anti-Islamophobia” initiative and adopted a new program that focuses on protecting students of all religious beliefs from bullying and discrimination. In addition, the Board voted to back away from forming another official partnership with CAIR, a controversial Muslim advocacy organization with longstanding ties to Islamic extremism. The Board’s reversal was a response to FCDF’s federal civil rights lawsuit filed on May 22, 2017, on behalf of five families and two local grassroots organizations. The suit alleges that the “Anti-Islamophobia” initiative violates the U.S. and California constitutions as well as multiple state statutes. FCDF’s second CPRA request demanded any and all records regarding a terror incident on May 12, 2017, at Patrick Henry High School in which a student threatened to “shoot up the school.” After the incident, an anonymous SDUSD insider reported that the suspect was a Muslim student and that the school district purposefully engaged in a “politically correct” cover-up of the circumstances surrounding the incident so as not to put its new “Anti-Islamophobia” initiative under public scrutiny. Once again, SDUSD has not produced a single record related to the incident. An additional concern is the Board’s efforts to shut down public scrutiny of its actions. Shortly after the Board rescinded the “Anti-Islamophobia” initiative, it unanimously voted to delete all emails older than one year from district servers. The San Diego chapter of the Society of Professional Journalists has condemned the new policy as a threat to transparency. SDUSD has indicated that the decision will not affect ongoing records requests.